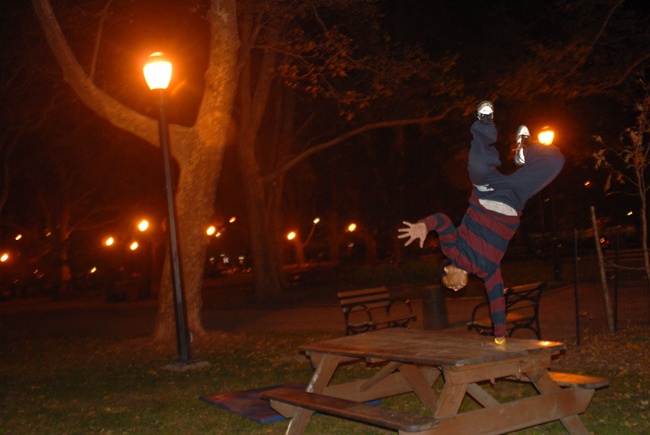 Brandon Lopez, 14, of Red Hook, practiced parkour on a recent cool night in Coffey Park, before the freeze set in. Parkour, also known as free-running, is an urban sport originating in France in which participants run and use their bodies to jump and flip over obstacles in the most efficient way possible. According to Wiki, a practitioner of parkour is called a traceur if male, or traceuse if female, after the French adjective “traceur,” for something that leaves a trace or a trail behind it. Free-running is a bit more dramatic than parkour. Lopez and his friend Alvin Santana, 15, had mats and were flipping off of trees and a picnic table, honing their craft. I live in Red Hook and VERY close to Coffey Park. I am 13 years old and would like to join in any free-running sessions if I can. I mostly train alone and have looked through the internet for fellow traceur!